and said it would make for a good blog post. I thought it would make for interesting class discussion. So I showed the video in class. I didn't say anything other than: "Here's an interesting video I thought we could watch." 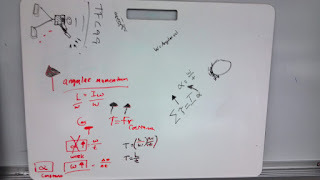 After the video I asked the groups to talk about what they had observed and whiteboard everything they could think of to describe the physics displayed in the video. Here are what 3 groups came up with. The group that came up with "the tangential force caused angular acceleration" was pretty proud of that statement. 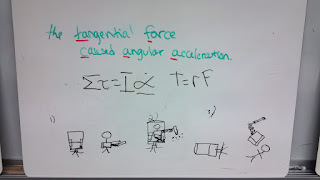 We talked about how using the concept of torque was probably better. 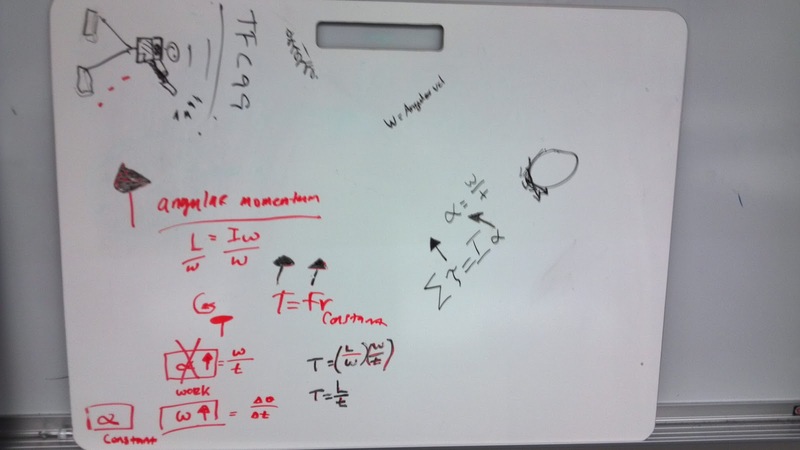 And, of course the best whiteboard was not photographed because I didn't get my phone before it was erased. 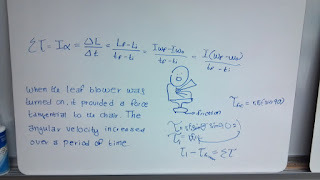 That group not only identified the torque and angular acceleration, but the change in moment of inertia when the guy's leg came out of the seat and the change in center of mass which caused him to tip the chair over. I was really impressed. Tonight I had another one of those deja vu moments where I realize (after too long stumbling around) that I've been down this particular road before. I'm leaving this note here for myself to remind me in the future how to do this trick. After getting it to work I decided that I wanted the full sized image for the course page. A bit more googling, and I was able to find a better RSS feed which I plopped into the Feed2JS code generator. Now I'm a bit scared to search through my blog archives because I'm wondering if this is something I tried leaving myself a note about in the past. Here is where I'm dumping some links to Finite Element Analysis (FEA) software that I was looking into a few weeks ago. SfePy - FEA libraries in Python for those who want to roll their own solutions. CalculiX - "A Free Software Three-Dimensional Structural Finite Element Program"
I have four videos I want to remember for potential future use. I've been reading about and discovering the wonders of the work of Julius Sumner Miller. I discovered him when I was rummaging through our department's kit of "Physics of Toys". I had asked our lab coordinator if we had the manual for the kit, and he pulled out the book Physics Fun and Demonstrations which is essentially the manual for the kit. It seems like Professor Miller was the Paul Hewitt of his day. Notice that with the exception of rushing a bit at the start of that clip through the question of what the other person will predict, he starts by eliciting the misconception of the concept he is about to demonstrate. Also, he asks the other person (and therefore, the audience) to make a prediction before the demo is done. Channeling Eric Mazur or Interactive Lecture Demos? Not all the Miller videos are so pedagogically sound. Here's a video that Miller did of his toys series, which he rushes through all the demos and skips over some of the explanations. I picked one of the series to show here, but there are several other in the series to watch. 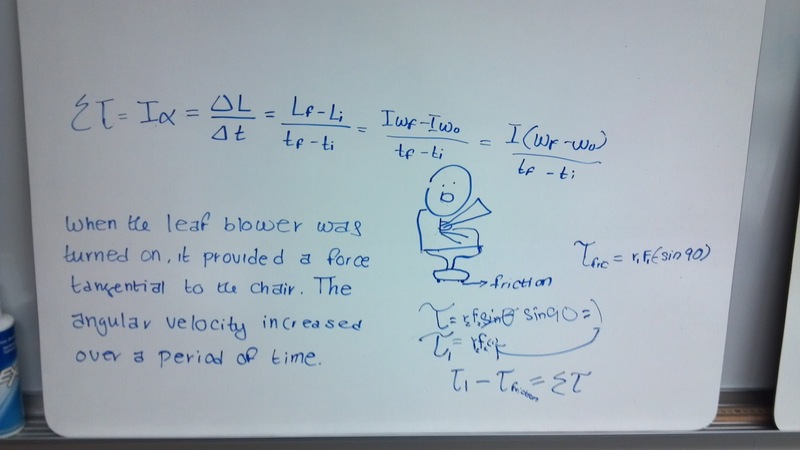 They are good for experts in physics, but not so much for novices.